The sun is down. The air is cool. A couple of pieces of seasoned oak sit nearby. Time for a fire. But there’s no real “spark” for a warming flame without worthwhile companions — my beautiful wife and a good bottle of Scotch. In the flickering light of the new flame’s nativity, as is my custom when enjoying The Balvenie, I call for all in attendance to pay careful homage to the sound of the cork’s retreat. In this case, the crowd consists of my bride, the rustling maple trees near the street that overarch my driveway, and the secluded oak trees in the rear of the neighboring yard. With regard to the trees, it’s worth their while to listen – namely the oaks. Their kin played a part in this edition’s birth. 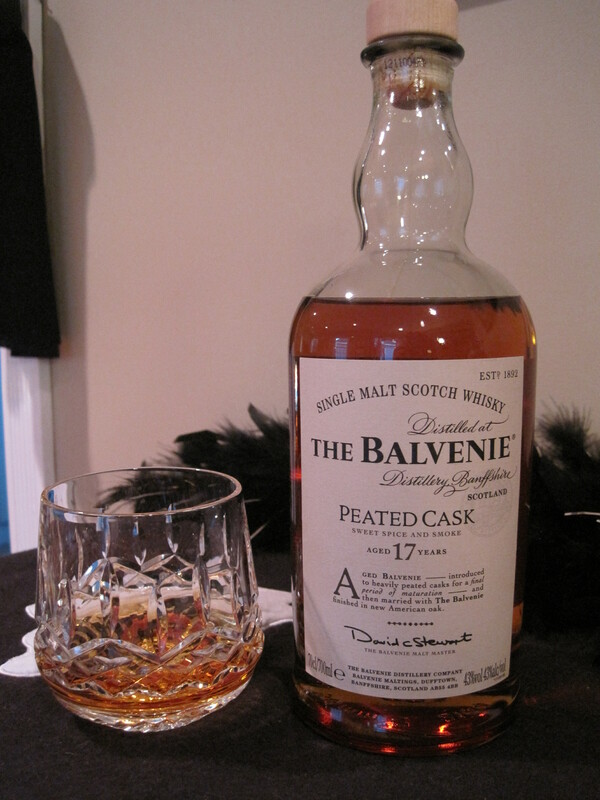 I received this bottle of The Balvenie 17 year old Peated Cask as a gift from the son of one of my parish members. He flies C-130s for the Navy. He called his mother about three weeks ago to let her know he would be landing in Scotland and wanted to know if I wanted anything in particular. She called me that night at about 9 p.m. and asked if I had a fancy for any particular bottle. What a joy it was to receive this edition. Well done, Commander! Even as the smoke from the fire before me is now wafting pixied sparks into the sky, the nose of this single malt is strong and undeterred as it, too, desires all of your senses and rises in tandem carrying similar but much more interesting mythical wonders. Finished in new American oak casks, at first scent, this wonderful edition indeed offers the peatiness teased upon the label. But in the midst of the earthy, swirling moss, The Balvenie’s typical honeyed incantation is spoken and I am lured by the indication of something beyond the edge of these woods that is much sweeter. With the first sip, the palate experiences the unfurling tapestry of a sweeter spice influenced by oak, rolling and billowing on the mossy plumes I met before. The finish, so nice, but short, very clean, leaving you wondering just how something so wonderful could be gone so swiftly – like the tiny ember that pops free in the fire, the sound grabbing your attention that you would be amazed by its fleeting beauty; and you follow, follow, follow it to the sky – then it’s gone. Good thing I have plenty more logs for this fire. Good thing I just opened this bottle and it is relatively full. I am new to whiskey, having originally been scared off by a turpentine tasting shot of it in my early 20’s. My mother introduced me to good Glenlivet last year, and to my surprise I liked it. Upon her recent death my brother gave me the rest of her bottle of Balvenie. He mentioned the woody taste, and when it encircled my palate I was enchanted. It brought back memories of sitting by the fire, watching, smelling, and tasting the burning oak wood that is so abundant on my parent’s property. I intend to thoroughly enjoy this bottle, and to celebrate Mom,a wonderful child of God who is now resting in the arms of Jesus.